Goodreads: The man she loved is gone forever. The child she lives for could be next. Each day is a struggle for Amanda Gleason&#39;s newborn son as he battles a rare immune deficiency. Justin's best chance for a cure lies with his father, who was brutally murdered before Amanda even realized she carried his child. One emailed photo changes everything, planting a seed of doubt that Amanda latches on to for dear life: a recent photo of a man who looks exactly like Paul. Could Justin's father be alive? The mother in her is desperate to find out. But tracking down a ghost when every second counts is not for amateurs. Forensic Instincts is the one team up for the challenge. The manhunt is on for the elusive father. Yet the further FI digs into his past, the more questions are raised about whether the man Amanda fell in love with ever really existed at all. Dark secrets. Carefully crafted lies. From the congressional halls of Washington, D.C., to exclusive Hamptons manors, there are ruthless people who would stop at nothing to make Forensic Instincts forget about the man Amanda desperately needs to find. Kritters Thoughts: The second in the series, and unfortunately I read this series out of order, so I suggest stopping where you are at and going and finding the first and the third and read this one in order! So the team was assembled in the first book and in this book, they get to take on a new case and it has fantastic twists and turns. I loved how the case is solved by using each of the member's unique skills and without each of them it wouldn't come together as easily. It was interesting to see the interactions from this private firm and the police and FBI. 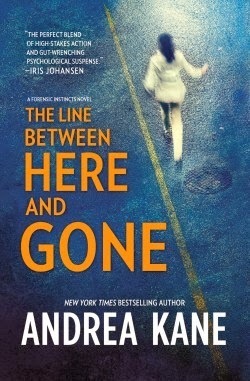 I am officially a fan of Andrea Kane and this series and hope that these three are just the beginning! I loved this series, so good. Andrea Kane is a favourite of mine.